CHONBURI: Languidly ploughing flooded paddy-fields, Thailand’s buffaloes don’t usually strike people as the quickest of beasts. But farmers in eastern Thailand recently showed off their fastest bovines in a unique, muddy speed test. The race is the highlight of an annual rice planting festival in Chonburi, two hours east of the capital Bangkok, where a small group of local farmers try to keep the tradition alive even if most of their fields are now ploughed by tractor. Throughout the day pairs of buffaloes attached to a wooden plough thundered down a flooded field as human drivers attached by a rope desperately tried to keep up behind their charging beasts. Many racers found themselves faceplanting into the mud, sparking cheers and laughter from the crowds. But for those who stayed attached and won, glory awaited. For centuries Thais relied on water buffalo to plough their rice paddies, provide transportation and even defend villages during war, but with mechanised farming the animals have seen their importance diminish. Local official Samart Suksawang said the festival was about reminding youngsters of the crucial role beloved bovines played for farmers in what is one of the world's great rice growing nations. “I want to preserve it so that the new generation can see that in the old days, to do rice farming we used buffalo to plough and rake the rice fields,” he said. Locals say the idea to race buffaloes began generations back as a way to blow off steam after the arduous ploughing season. 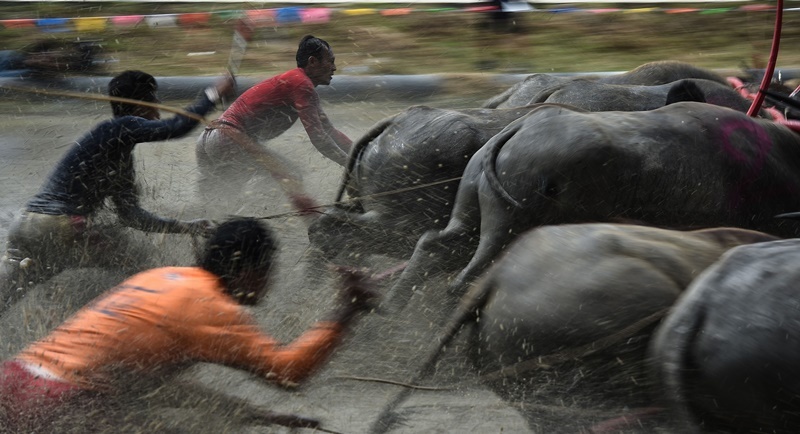 Now racing buffaloes are specifically bred for the sport, taught to obey the commands and whistles of their owners. The most successful can sell for up to B300,000.